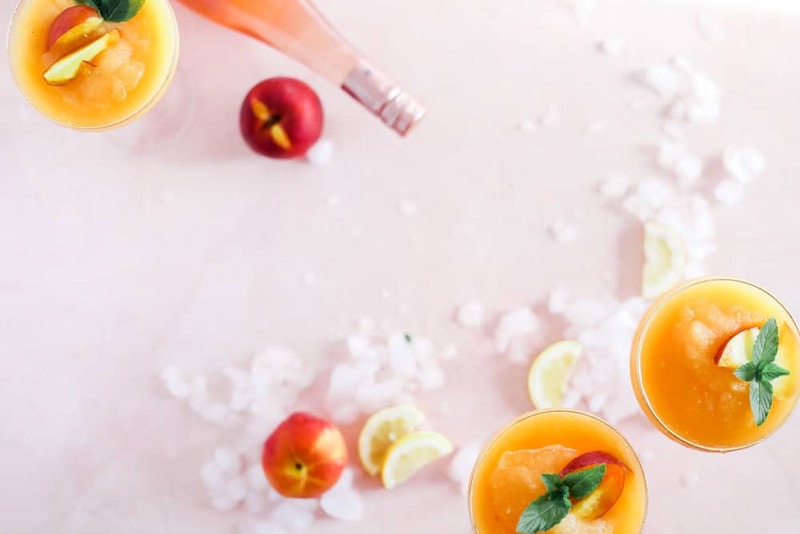 This easy strawberry peach frosé recipe needs to be on your summer cocktail rotation, stat! 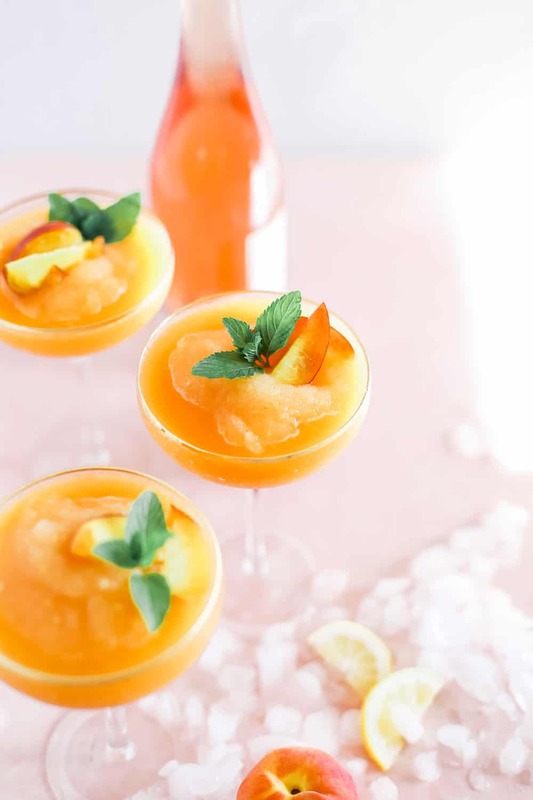 We have been slurping on this frozen wine slushy all summer long to beat the heat. 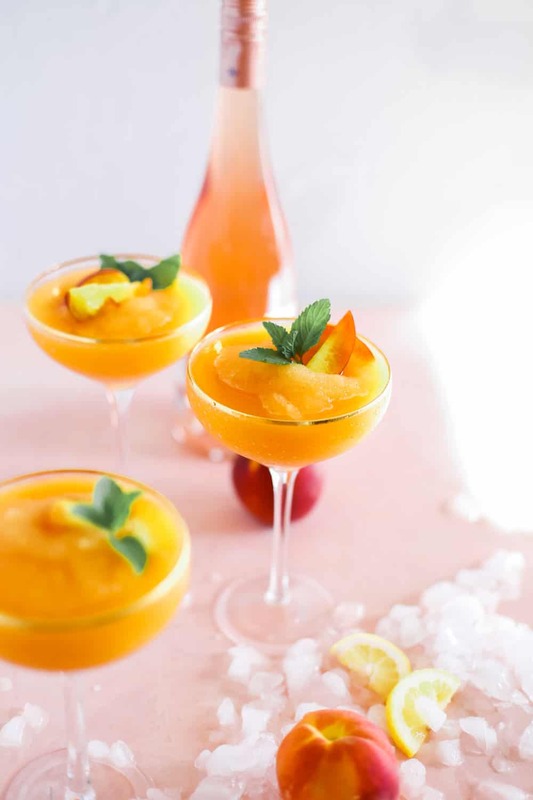 This easy recipe comes together with a few simple ingredients like frozen rosé blocks, sweet strawberry simple syrup and frozen peaches. All you need is one blender and plenty of wine glasses! Scroll down to watch the fun video that we made and the simple recipe! I have been waiting for this post to come out ALL SUMMER! This is 100% my favorite cocktail I have made all summer. I was so excited for this strawberry peach frosé recipe that I made a fun video for you showing how to make this slushy, fruity, frozen cocktail. My dearest friend Sabrina in the video loves a sweet wine drink so I had to make sure she got in on the action. This whole strawberry peach frosé recipe was inspired by two different things. 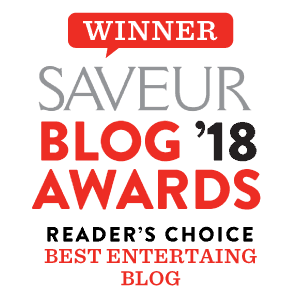 One, my love of slurpees as a kid. During these hot summer months during summer vacation I was so excited to head to 7-11 with my parents after they got off work. We would go in the evenings after an afternoon of swimming and usually some kind of bbq’ed dinner. California summers were very casual in my family’s home and its those simple afternoons that were some of the best. I can remember being sunburned, exhausted from swimming and drinking a mega blue and cherry slurpy. Gah, those were the days. The thought of having one now makes me want a shot of insulin near by. Which brings me to reason number two why strawberry peach frosé will be one of your favorite summer cocktails! This whole summer I have been CRAVING a slushy cocktail. 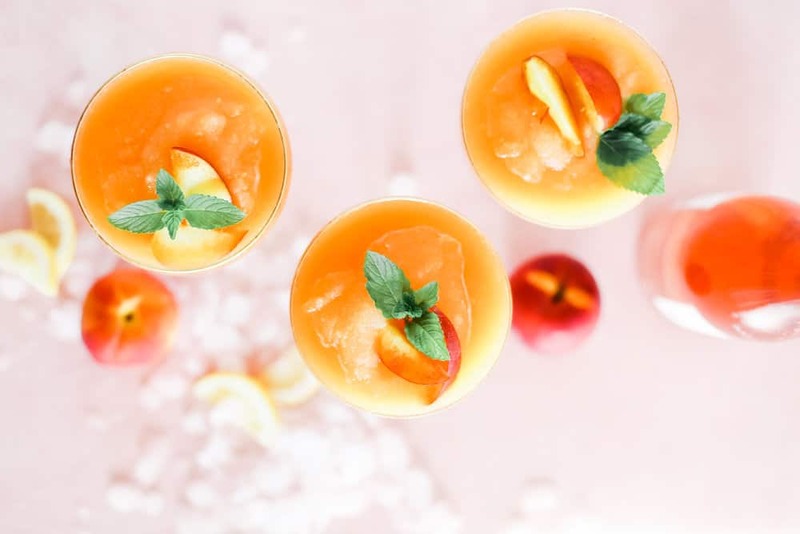 For some reason my pinterest cocktail board this summer has been flooded with slushy cocktails. I knew that frosé was mega trendy in the food world, so I thought what the hell I’ll give it a shot and finally kill the craving. There were tons of frosé recipes out there that featured literally blocks of frozen rosé. Basically like pour frosé into an ice block mold, blend it up and call it good. BORING. I wanted to stick with flavors that are in season so I went with strawberries and peaches. 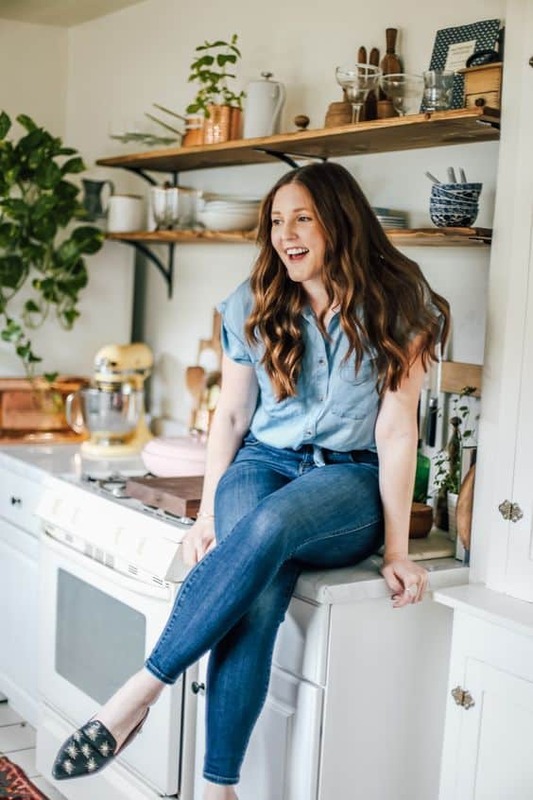 Plus, I just freaking love peaches and try to sneak them into recipes as much as possible, like this pie and these smores! The actual recipe literally comes together in seconds but you have to be a little prepared. The night before I make a super simple strawberry syrup (literally water, sugar and strawberries) and let it chill over night so I can just be ready to go the next day! Next, you have to freeze up the rosé cubes at least (4-6) hours before blending so I like to do this the night before as well. The blocks won’t actually freeze completely because of the alcohol content so they might be a little crunchy, thats okay! Last but not least, get your peaches frozen too! I used frozen peaches because they kept the drink a lot colder and didn’t melt the drink (like regular temperature peaches would). After that you’re pretty much done. Like for real. Put everything inside your blender and turn that baby on for like 30 seconds or until nice and smooth. Simple, boozy, fruity. You’re going to freaking love it! 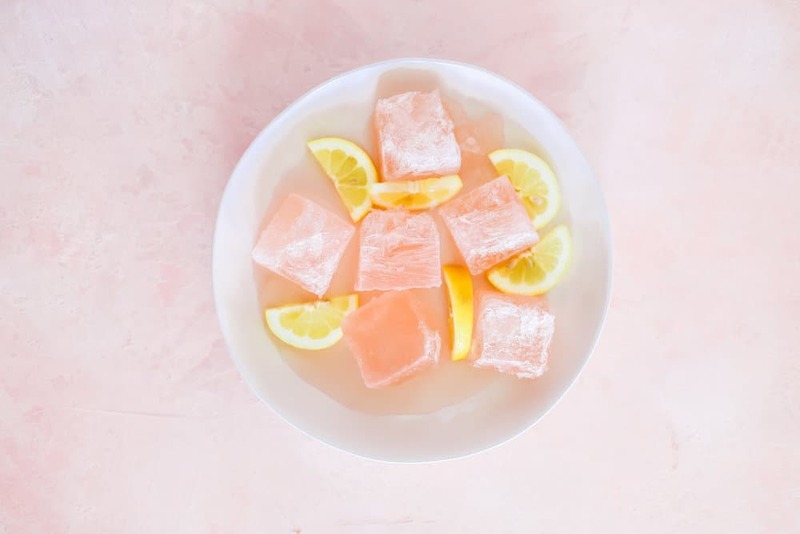 Pour bottle of rosé into ice cube mold and freeze 4-6 hours or overnight. In a small sauce pan heat sugar and water on medium heat until clear and melted. Add in strawberries and bring to a soft simmer. Remove sauce pan and syrup from heat and allow strawberries to steep for 30 minutes. Strain syrup from strawberries into a jar. Refrigerate syrup for 30-60 minutes before using. 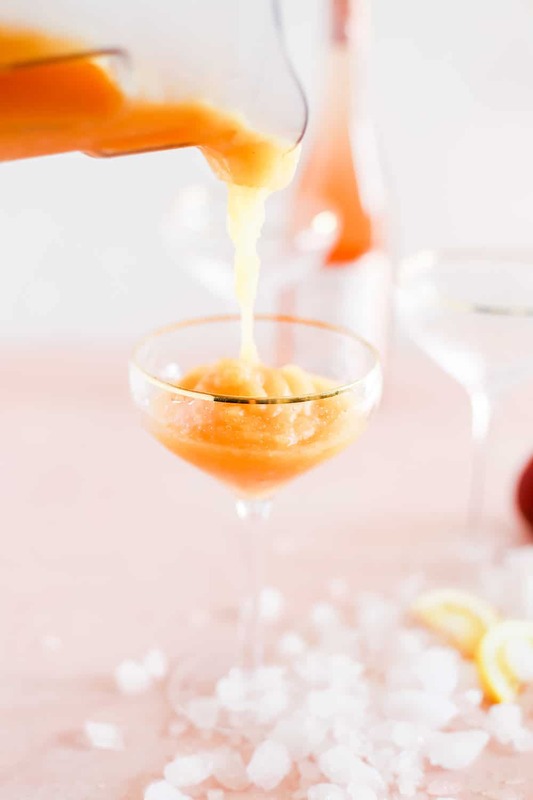 In a blender combine frozen rosé blocks, frozen peach slices, strawberry simple syrup, and limoncello. Blend for 30-60 seconds or until smooth and frothy. 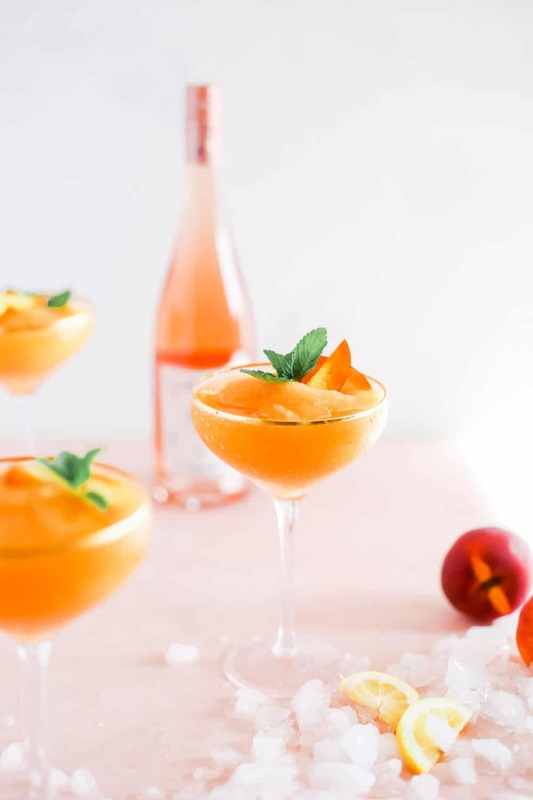 Pour into wine glasses and serve with fresh peach slices and mint sprigs.